Although most suppliers of drinking water in our country meet the standards set by the regulatory bodies, there is a growing list of threats that can contaminate it as it finds its way into our homes. These threats come about as a result of water being contaminated by the by-products of modern lifestyles. The leading water contaminants are chemicals from pharmaceuticals, automotive coolants, pesticides, cosmetics, microbes, toxins and perfumes, among many others. Drinking contaminated water is something that can really jeopardize your health and thus need to be avoided at all costs. While this sort of contamination occurs irregularly, when it does, the results can be very deadly. Simply put, the effects are very catastrophic for people who become ill. Here are five surprising things that can jeopardize your health where consumption of contaminated water is concerned. Contaminated water is the leading cause of cryptosporidiosis outbreaks. The consequences for this outbreak are often serious in nature and victims either get treated there and then, or hospitalized or worse, dead. A number of outbreaks can be traced to bacteria or virus contamination. This is mostly linked to human and animal waste. Pathogens such as Cryptosporidium are able to pass through the installed the filtration and disinfection system to cause a number of deadly gastrointestinal ailments. This is a colorless, insidious and odorless natural occurring gas that is known to find it ways into underground storage and drainage systems. Being the invisible killer it is, and you will never notice radon contamination until it is too late. Fortunately, this sort of contamination can be avoided by taking the right remedial actions if your home is determined to have a radon issue. All openings, including piping systems where radon may enter your home or water system need to be properly and professionally sealed. Radon testing, diagnostics and reduction projects however should be left to the trained professionals as they have the right experience and tools for the job at hand. 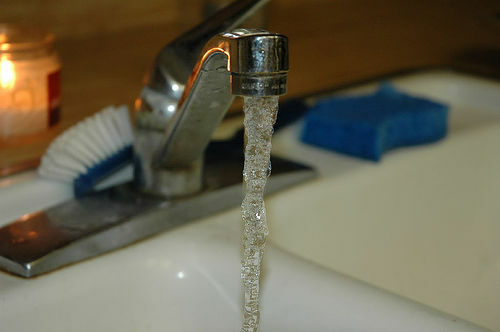 Yes, your old tap can be the cause of all health issues at your home. We all take it for granted, but old and thus outdated water systems the taps included can leech potentially dangerous chemicals and heavy metals like lead into your drinking water. These outdated water carriage fixtures need to be replaced with better and modern varieties so as to prevent your drinking water from getting contaminated. Modern homes greatly benefit from contemporary construction techniques and state of art building materials. Old homes, especially those that were constructed before 1978, on the other hand may contain contaminants such as asbestos and lead paint which are very deadly if they find their way into our drinking water. The task of removing lead paint and asbestos from an old home is both time consuming and dangerous, meaning that it is best left to qualified professionals. Mold that finds it ways into your place due to high moisture levels that is brought about by leaky water storage facilities, piping systems and the likes can cause a lot of undesirable effects on your health. The results mold leads to a number of physical diseases, for instance asthma, a host of respiratory infections, itchy eyes, skin rashes and the likes. Removing hidden molds from your place is a hard and expensive task that is best left to the professionals.